Finally, the second zone's on Frontline! It only took about 4 months guys!! ;) However, if my playthrough of the area is any indication (1 hour 20 minutes), it's a decent amount of playtime for that amount of work, at least compared to our previous areas. Anyway! We'd love to hear how long it takes you to play the area, if you got stuck anywhere, what you liked/disliked and, of course, any bugs you found! Please spam away, we'd love to hear everything (and feel free to link us any cool Let's Plays of the area, as seeing how people think and try to interact is extra important in this area). Since out goal is to bring the second Tai Ming zone to Frontline this weekend (not sure we'll make it yet, but here's to hoping), I decided to post this third and final (!!!!) Zone02 Mixed Bag today instead of Sunday! Second part of this scene is all about the backdrop! And what else would it contain, but your old home, the Pillar Mountains? So, today we had another design meeting (as mentioned yesterday), where we talked about what we wanted to add or change with the second Tai Ming zone. Today we got to do something awesome: we actually play tested Tai Ming's second zone!! 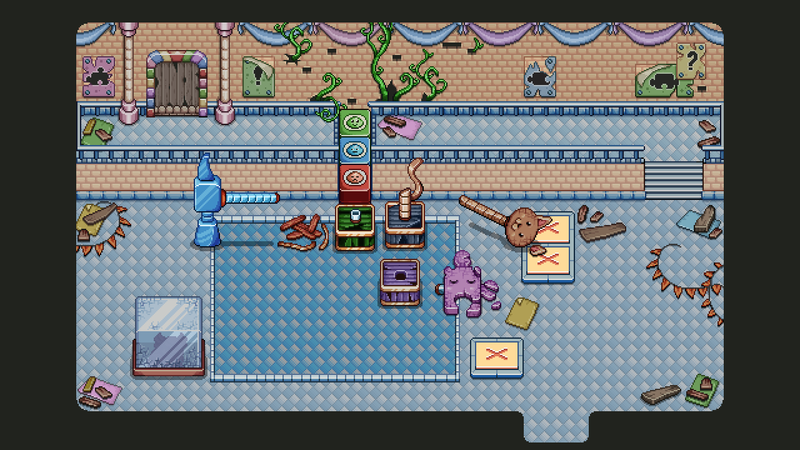 It's true, after many months of working on this place, Teddy put enough together that it was possible for us to run through almost the entire zone, with the exception of Puzzle World. 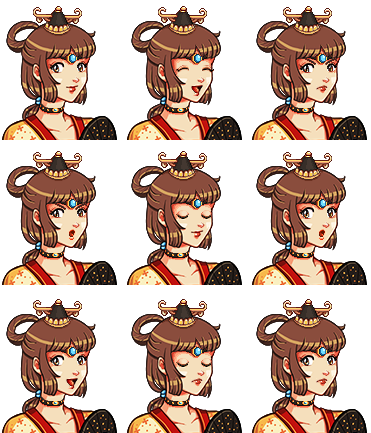 Finally (for now), the fourth and final batch of expressions features an accessory saleswoman, Faita from zone one, who you could say has fallen on hard times - at least if you go by her expressions, a male priest, the greedy owner of Puzzle World, the visitors from Flying Fortress and the gardener from zone one, who is still tending to the gardens, only this time in zone two! 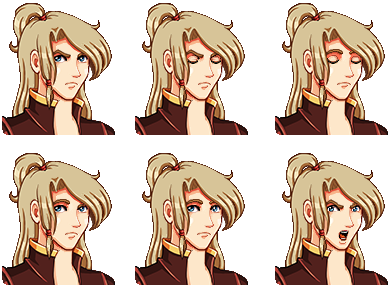 And now, for something completely different: expression! 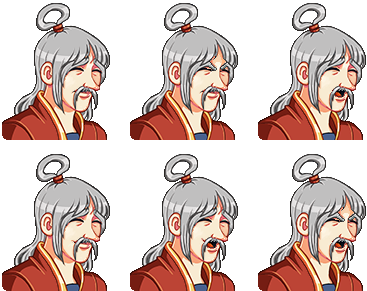 Tai Ming's second zone is quite cutscene and character heavy, so there's a loooot of expressions that need to be made. This is actually just the first of four parts, so be ready for a bunch! She's both happy to see you, and has some serious worries on her mind. Wonder what those are about.. Since his adoptive father's speech about being strong, Zhamlas life has taken quite a serious turn, and unfortunately there's not a lot of room for positive emotions in his life nowadays. To make it easier seeing where any given statue needs to go, we decided to keep their boxes on the floor (who also got slightly different dimensions since the last post) in the present, in various states of decay. 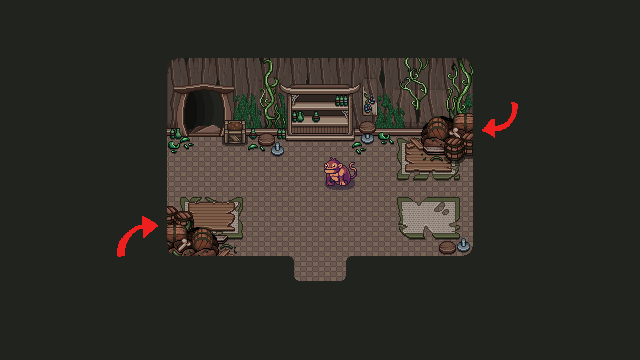 The alternative would have been to have the statues fall with base and all, but we believe this makes it easier to read which statue is where on the puzzle floor. There's still two things I need to make for this room. First we need standing, decayed version of the statues for present times, as the statues won't fall if they're standing next to a statue that would block the direction it would have fallen in. This is mostly to make it easier for us - instead of having to figure out how to stack the statues on top of one another, they just won't break as severely if it means they would have fallen on top of another statue. Last time I finished the "Path Puzzle" room, where you'll push a set of statues into places which allows you to open the door and progress to the next room. I didn't actually make the statues however, so that's what today's post is for! There's one long statue that will fall to the right in present times (the cat). There's also a short statue that will fall to the right in present times (the puzzle), a hammer that falls to the left, and a "slime totem" which falls upwards! Now, time to transform the final Puzzle World room into its present version! And now, another quick & dirty Mixed bag, with the last bunch of improvements! As the third zone of Tai Ming - and the final challenge(s) of the dungeon - draws near, we decided it was time to have a meeting to flesh out the final boss of the dungeon: an ancient Mimic! The next room in Puzzle World is the monkey challenge room, which has been previewed in a previous post. Here, the player will try to steal back a key from a gang of annoying monkeys, intent on keeping the key to themselves! And now, a battle room! As you might guess from the name, this is where a bunch of battles will take place, likely an encounter with several waves (though we haven't decided on any specifics yet). 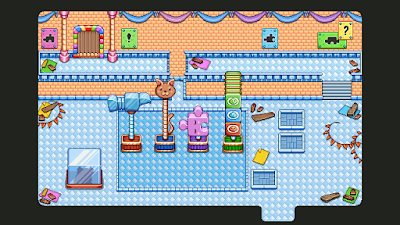 Since Puzzle World's Phase Shift room involves phasing through time, it's time to make a present version!